In 1965, during the summer after my first year at Solihull School, we went on a school holiday to Benodet in Brittany. 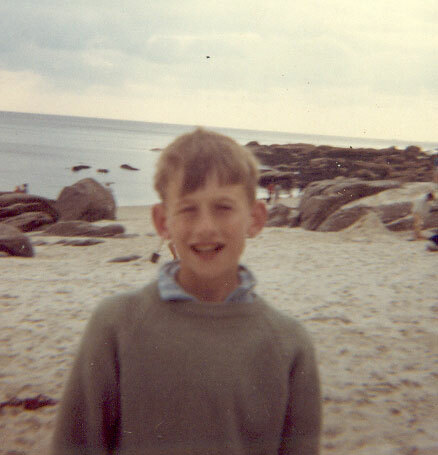 My first day in Brittany was August 28, 1965, 30 years to the day before Charlie was born there. The holiday was managed by Ernie Halstead, the Head of the lower school, and his wife, either side of me (with mum’s always helpful ink around my head). The little chap in front was the Halsteads’ youngest. Ernie was the first teacher to cane me, just one stroke after a Prefect turned me in for taking a short cut across the grass in the school quadrangle. His son in class was Peter, in front of me and his parents in the photo. Isabel Halstead, the blond daughter of the family who also accompanied us on this trip, was the subject of some serious schoolboy interest. Not mine: I wasn’t there yet. For months after I started at the school, I was scared every morning on the bus trip from Dorridge to Solihull. 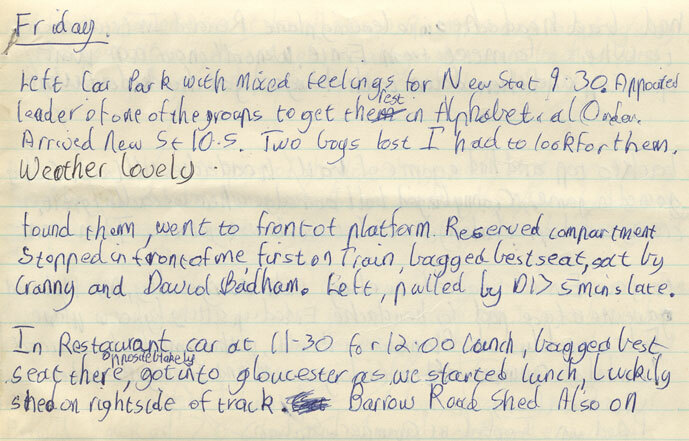 Here I was, little eleven year-old me from Hasluck’s Green, little and skinny-looking in the expensive, baggy school uniform, still learning how to tie the fancy burgundy and royal blue tie, the blazer a little broad across the shoulders, the pants a bit too cinched at the waist, on the top deck of a Midland Red double-decker bus, watching the countryside pass by and worrying about this class, or that homework, or the other game, or this or that boy. There was so much to fear. It was all different. It was all new, but it wasn’t just a new school, it wasn’t just a new city; although I’d moved house a few times, this felt like the first new world that I had lived in. Each day the fears dissipated, more quickly and more easily over time as the new world became increasingly familiar. But every morning I was scared about something, sometimes about nothing that I could place or recognize. The fear may even have gone on longer than the first months, throughout the years there. But it was the most intense at the beginning, on the top deck of the bus into Solihull, as I commuted into town to meet my new world. 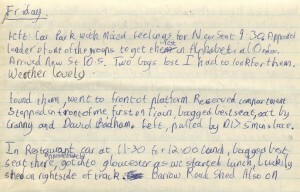 I briefly kept a diary on the train from Birmingham to Exeter, the first step of the trip to Benodet. We then flew to Jersey and on to Quimper, and finally by coach to Benodet. Train spotting was clearly the principal interest of this leg of the trip, along with “bagging” the best seats! In the evening, I worked. And worked. From the moment I walked in the door on Mill Lane. Three hours straight through was not unusual, sometimes four or five, at eleven and twelve years old. I sat at the kitchen table and ploughed through all the math, all the geography, all the history, all the physics, all the English, a constant and unending deluge of homework, night after night. And night after night I ached. It was so hard to keep working. The household whirled around me, chatting, watching TV, preparing our tea, doing the dishes, being a family together, living a normal family life, and I was stuck there, in the middle of them but not really with them. I wanted to giggle and chit-chat as they did together, I wanted to go out and play football, bike or train spot, I wanted it all to be the way that that it was before, to live like a kid at Haslucks Green again, but I was stuck with the work and no longer knew the neighborhood or if there was a local pick up game. I struggled to understand what we’d been assigned, struggled to force myself to figure it out, struggled to force myself night after night to keep up with that unending deluge of homework. On the beach in Benodet. This was a fun trip, even though I managed to be airsick and throw up on the flight out. I remember the wonderful bowls of hot chocolate that we were served for breakfast, and the tasty, real bread, so unlike the sliced bread at home. If I could. Most of the time I completed what had been assigned in the end, but in the meantime I made such scenes at home. I couldn’t get it straight, but there had to be a straight answer. I’d pace backwards and forwards, around the kitchen table or around the living room. “I bet Ian Summers got it,” or “I bet Cranny got it,” I’d think to myself. “Should I phone him? No. I have to get there myself. But how? I’ve been working at this for hours it seems like, and it just doesn’t work.” Tears of frustration might follow. Or maybe I’d throw some kind of fit, nothing too aggressive, but enough to release the excessive stress. I had figured out pretty early in life that if I was too stressed I could not advance toward the answer, but that sometimes discharging the stress was enough to get there. But even after all of this pantomime, and I’ve always been able to carry a good pantomime, I sometimes could not get there, to the right answer, despite all my intellectual and emotional efforts, and there was no shortage of both kinds of effort. The work was so hard. The teachers set it that way. The point was to make the child exert his brain, and do so again and again, teaching it (the brain, not the child) how to accomplish more, forcing it to accomplish more. In many ways it was a brilliant strategy for expanding the grey matter, but we were so young, and it hurt. It hurt so often and so consistently that I began to feel that the morning’s fear and the evening’s hurt were the human norm as you got older. We all wore uniforms at Solihull School, day boys like me as well as the boarders who lived there, which no-one wore at Hasluck’s Green. I learned later that their purpose was to conceal differences in relative wealth between us, a laudable egalitarian spirit. What undercut that laudable purpose was first that the uniform was very expensive, much more expensive than my normal clothes, to the point where mum and dad could barely afford to buy one. The only clothes shop in Solihull authorized to sell the uniform charged monopoly prices, knowing that the parents had no choice. So we bought mine a little on the large size, so that I’d grow into it, and I wore conspicuously baggy clothes to school. Plus we skimped on things here and there: the uniform encompassed everything that a kid could possible wear at school, from jacket and tie through gym clothes, scarves and a raincoat. Buying a whole new wardrobe was out of the question for mum and dad. What was designed as a tool for reducing inherited disparities in means became in Solihull’s hands a means to make the less well-off feel different and inadequate. Simon Billing with his back to us as the Queen planted her tree. Not sure that it prospered, that tree. Ian Summers found this photo, taken from the local newspaper at the time, in 2007. Hence the poor quality. The school had a knack for undercutting its own ostensible good intentions, just as it had done in establishing a scholarship program that ended up only benefiting the children of privilege. I am convinced looking back that the good intentions were applied with the conscious bad faith of proving them wrong. Men who held it to be a self-evident truth that the poor were better off knowing their place and staying there, who sincerely believed that only bad could come from perverting the natural order of things by giving even the most intelligent of the poor a leg up, created the Solihull School scholarship system. The liberal tradition between the wars first opened the doors of fee-paying schools to a few of those who could not afford them, and then the socialist movement after the Second World War threatened to dismantle what the socialists recognized to be the key bastion of the UK’s class system, private schools reserved for inherited wealth. As a defensive measure, these same schools now announced to the world in the face of this political threat that they were no longer the exclusive preserve of the wealthy, no, they now offered free places on a competitive basis to whoever qualified, regardless of financial situation or class background. What a crock of hypocritical bullcrap! 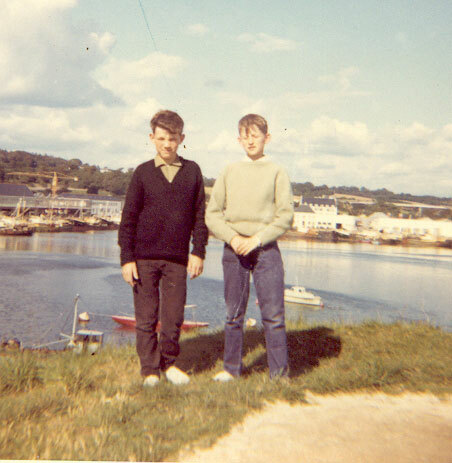 With “Cranny,” Richard Cranstone, somewhere around Benodet during that school summer holiday in 1965. We were 12. Cranny was very bright and a good friend at the time. I should not complain. This interpretation is perhaps colored by a chip on my shoulder, and I was doing very well. My fancy theories, however convincing now, were far away at the time. By winning the scholarship from a state school in the first place, I had unknowingly overcome the school’s perversion of the purpose of its scholarship program before even starting there. Not that I was the child of poverty. Although mum’s side of the family had been pretty poor for the generations back that we have been able to trace, dad’s had its more successful members, and his own father’s terrible health was the principal reason that dad was raised with limited means. “Limited means” refers to someone of reasonable standing in an unfortunate situation. It does not mean poor. But I had gained admission from a state school, and once in the door mum and dad were doing their best to help me concentrate on making the best of this wonderful opportunity. And it was a wonderful opportunity. Even an eleven year-old could appreciate that the facilities were far superior to those of the competing state schools, if competing is the right word, if facilities was the right word for what we had at Haslucks Green. 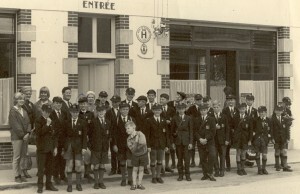 Haslucks Green had class rooms and a canteen but no gym, library or chapel. Solihull had all three, and an all year round cricket pitch, which no-one used for eight months of the years, several rugby pitches and tennis courts, a running track, the list went on. The Queen had planted a tree in 1962, not three years earlier, in front of Solihull School’s newly-built chapel to celebrate the school’s 400th year. The number had me much more in awe than Her Majesty’s recent presence, which was impressive in and of itself for any English schoolboy. The Queen has perhaps not yet visited Haslucks Green! Bruce McGowan, the Solihull Headmaster who had interviewed me for the scholarship, had more in common with a Chairman of the Board than with Mr. Fox, the chain -smoking, yellow-toothed headmaster at Hasluck’s Green who had been so kind to me. Bruce was not a better man because he was at a “public” school or because his teeth were whiter, but his situation was perceptibly a step up, just as his spacious upstairs office looked down on Mr. Fox’s cramped and smoke-filled quarters. I could feel the difference. I grew easily fond of some of the teachers, in particular Messrs. D.J. Morton and P. R. Ansell. We knew Morton affectionately as Bogbrush, after his wiry, curly hair resembling the sort of brush that is used to clean a toilet, or “bog” in schoolboy slang, and Ansell as Swatty, because that is what he made us do, work hard or “swat” in schoolboy slang. They made us work, but at least knew what they were doing. Both of them loved what they were doing, both teaching and their subject matter. Bogbrush taught literature, and Swatty math. I learned beginning differential calculus from Swatty, along with the rest of the top stream, before turning 14. He invited me over to play billiards at his house once, which was considered a bit of an honor. Unable to resist the opportunity to teach a little more math, he tried to help me understand angles by pointing out how and where to hit the billiard balls. He went on to die childless and to found a scholarship program for children who are particularly skilled in his beloved math, which did a lot to help me forgive his impatience when we could not follow exactly what he wanted us to follow. Harry Crow, far left, and Bogbrush, far right. Taken from the 1969 school portrait, and thus of poor quality. Harry Crow, Mr H. R. Rickman, would give me the most painful caning of my years at Solihull. Bogbrush, Mr D. J. Morton, singlehandedly inspired in me a love for drama and literature generally. Look at his expression! By 1969, when this photo of the whole school was taken, he was losing the wiry hair that inspired his name, but not the name itself. The fear every morning fueled me. The pain every evening fueled me. The desire to conquer the new world fueled me. The baggy uniform and its missing pieces embarrassed me and made me feel self-conscious, but even that fueled me. The results were not long coming. As a scholarship winner, I was automatically placed in the top stream out of four, with the smarter boys. The smarter boys were generally kinder. During my first year I crept up the rankings in my class, and still remember the one kind boy who sidled up between the desks, benignly neglected by the teacher, to congratulate me the first time that it was announced that I had come top of the class for a period. Results were announced publicly and often. Coming top in that class was coming top in the age group in the best school in the area, one of the top three in Birmingham and its environs, population well over a million. I was not the smartest kid in the class. Ian Summers was, and proved it with his career, University Professor of Physics. But I was well up in the also-rans, and even at Solihull, even after climbing up the ladder to be among the smartest boys in the whole area, I could still come top here and there. I felt on top of the world, at least until the next results when I wasn’t top any more. Bogbrush had us read plays and novels as a means of arousing our interest in literature. I very quickly learned to love reading out loud, expressing what was in the novel or play with my voice, and soon was reading many of the lead roles. It was a chance to show off constantly, and the other boys were kind enough to let me. When Bogbrush asked the class if they were tired of me reading the lead roles, they assured him that they were not. These were genuinely kind boys, sure enough of themselves to let another star when it was the other’s turn. In this field again I was a success, thanks to them and to Bogbrush. During my second year, the school entered us all in a public speaking contest. I was almost paralyzed by fear before it started, and even when I started speaking was afraid that my throat was going to lock up, literally. I was shaking, my hands were clammy and I was trying not to think about the bathroom. I looked out at the spectators, the judges, and forced myself to block them out and to think only about the text and the feelings that each line evoked. It was like reading a role for Bogbrush. I had to quickly grasp where a particular passage or speech was going, and express it. Except that in the competition, I needed long pauses to overcome the paralysis brought on by the fear, and these pauses gave me the extra time to properly grasp the meaning inherent in the text. Bogbrush’s training and the other boys’ tolerance of my taking the leading roles in class paid off. I won the competition. 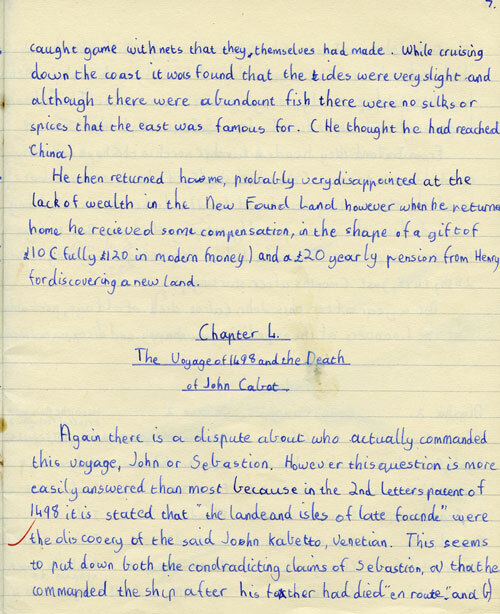 A page of a 1965 history project. I picked John Cabot, who arrived in North America from Europe before Columbus. I had never played rugby before Solihull, and knew nothing about the game when I started at the school. It was a game that was a part of the new world, a world in which there was no organized football. Football was relegated to the less pretentious state secondary schools: the “public” school prided itself on playing rugby. The basic rule of rugby was and is ludicrous: you cannot pass the ball in front of you. You can run it forward or kick it forward, but you can’t pass it forward. The rugby ball looked ridiculous too: it was oval in shape, and bounced every which way with total unpredictability. Then there were scrums. Scrums are collections of boys, eight a side, bent forward, arms wrapped around each other, trying not to collapse in a heap and subsidiarily to push the eight boys on the other side backwards. It sounds coordinated, and at a professional level can look that way, but for us boys it was anything but. Despite its initial strangeness and absurdity as a game, I scored a try during my first training session and took to rugby like a fish to water. With my agility, foolhardiness and speed, I was practicing with the under 13s school team within a couple of months of starting at the school. I played two or three times for the school rugby team, which for a skinny boy like me was very flattering. All the boys my age were entered in a cross-country run toward the end of my first year: we were to run all around the school grounds. I started off in the pack, and somehow figured out that if I padded gently without bouncing up and down I could reduce the stitch in my side. With the pain reduced, I advanced through the other runners as the race went on, not giving it my all, not burning myself out, not bouncing. All my football at Hasluck’s Green and all the biking were paying off. By the finishing straight, only John Moore was ahead of me, and he was panting hard and visibly struggling. He turned and saw me, and panted out, “go on Stocky.” I would have passed him anyway, but his encouragement felt good. I shot past him and won the first cross country run that I ever entered. The elation was startling. I collapsed on my stomach exhausted, panted and heaved on the ground, struggling for breath, and felt pure, naked joy. I began to associate the dull emotional pain of homework all those long evenings and the sharp fear of those mornings on the double-decker bus with success. Success was everywhere that first year and a half at the school, fear was channeled into success, pain became success, almost everything worked. So many victories of different kinds filled my life in my new world that, when dad announced in late 1965 that, you guessed it, we were moving again for him to accept a better job, this time near London, and asked if I wanted to keep my scholarship and stay on as a boarder at Solihull, I said yes. I thought that I would like to stay on. We all thought that it was a good idea. It was the big promotion for dad, at last, to his company’s head office in London, and the increase in his pay meant that he could pay the fees for boarding. I was doing so well at the school that it made no sense to move away. That’s how it was decided, casually, without undue stress or concern. It all fitted together. Dad didn’t want his taking advantage of an important promotion to disadvantage me, to cut short my new-found success, my valuable scholarship. We all wanted the best of both worlds, and felt that it was obtainable here.